The LTC4311 is a dual I2C active pull-up designed to enhance data transmission speed and reliability for bus loading conditions well beyond the 400pF I2C specification limit. The LTC4311 operates at supply voltages from 1.6V to 5.5V and is also compatible with SMBus The LTC4311 allows multiple device connections or a longer, more capacitive interconnect, without compromising slew rates or bus performance, by using two slew limited pull-up currents. 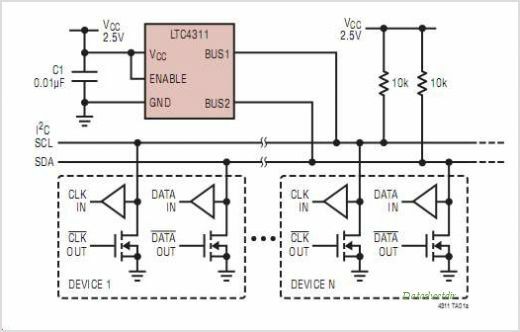 During positive bus transitions, the LTC4311 provides slew limited pull-up currents to quickly slew the I2C or SMBus lines to the bus pull-up voltage. During negative transitions or steady DC levels, the currents are disabled to improve negative slew rate, and improve low state noise margins. An auto detect standby mode reduces supply current if both SCL and SDA are high. When disabled, the LTC4311 goes into low (<5A) current shutdown. The LTC4311 is available in the 2mm x 2mm x 0.75mm DFN, and SC70 packages. This is one package pinout of LTC4311,If you need more pinouts please download LTC4311's pdf datasheet. This is one application circuit of LTC4311,If you need more circuits,please download LTC4311's pdf datasheet.